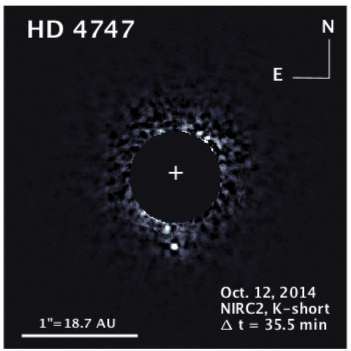 A team led by Justin Crepp has discovered HD 4747 B, a rare brown dwarf. As a new mass, age and metallicity benchmark, HD 4747 B will serve as a laboratory for precision astrophysics to test theoretical models. A team led by Justin Crepp, the Frank M. Freimann Assistant Professor of Physics at the University of Notre Dame, has discovered a rare brown dwarf, a faint object with properties in between that of a star and planet. In addition to taking its picture for the first time, Crepp's team also determined the brown dwarf's mass, age and composition—essential information that can be used to "benchmark" the study of these elusive objects. Brown dwarfs are objects thought to have initially begun the process of forming a star but were somehow interrupted before they accumulated sufficient mass and core pressure to ignite nuclear fusion—the process by which the Sun ultimately releases energy in the form of light. An important developmental bridge between bona fide stars and exoplanets, brown dwarfs are very difficult to study because their faint glow fades with time due to a lack of sustained nuclear reactions. The discovery of the object, which goes by the name HD 4747 B, was facilitated by 18 years of precise spectral measurements of the star that indicated it hosts an orbiting companion. "We suspect that these companions form at the same time and from the same material," Crepp said. "As such, you can infer physical properties of the brown dwarf from its parent star, like age and composition. There are no other objects for which we know the mass, age and the metallicity simultaneously and also independent of the light that the companion gives off. We can therefore use HD 4747 B as a test-bed to study brown dwarfs, enabling precision astrophysics studies for a directly imaged substellar object." In the past, brown dwarf masses have been estimated using theoretical evolutionary models. Crepp's team instead calculated the mass of HD 4747 B directly using observations of its orbit in an attempt to help refine brown dwarf models. It is expected that this work will in turn help to inform models for extrasolar planets. Based on a three-dimensional orbit analysis, HD 4747 B has a mass of about 60 Jupiters (a mass of 80 Jupiters is required to ignite nuclear fusion), well below the theoretical estimate of 72 Jupiters, although still within uncertainties. Forthcoming measurements acquired by Crepp's team will provide yet more stringent tests of the models used by astronomers for brown dwarfs. "This field is transitioning from 'Hey, I found something neat' to 'Hey, I know the mass to within a few percent.' Now, we can test theoretical models," Crepp said. The study has been submitted to the Astrophysical Journal. ... a rare benchmark brown dwarf orbiting the nearby (d=18.69±0.19 pc), solar-type (G9V) star HD 4747 ([Fe/H]=−0.22±0.04) with a projected separation of only ρ=11.3±0.2 AU (θ≈ 0.6''). Precise Doppler measurements taken over 18 years reveal the companion's orbit and allow us to place strong constraints on its mass using dynamics (msin(i)=55.3±1.9MJ). Relative photometry (ΔKs=9.05±0.14, MKs=13.00±0.14, Ks−L′=1.34±0.46) indicates that HD 4747 B is most-likely a late-type L-dwarf and, if near the L/T transition, an intriguing source for studying cloud physics, variability, and polarization. We estimate a model-dependent mass of m=72+3−13MJ for an age of 3.3+2.3−1.9 Gyr based on gyrochronology. Combining astrometric measurements with RV data, we calculate the companion dynamical mass (m=60.2±3.3MJ) and orbit (e=0.740±0.002) directly. Magma and lava say that there is no ignition, fusion and radioactivity.